Amid efforts by the Legislature to address immediate pension crises in Houston and Dallas, some see an opportunity to push for a sea change in how cities fund pensions. Critics predict such a move could drive first responders away in droves. 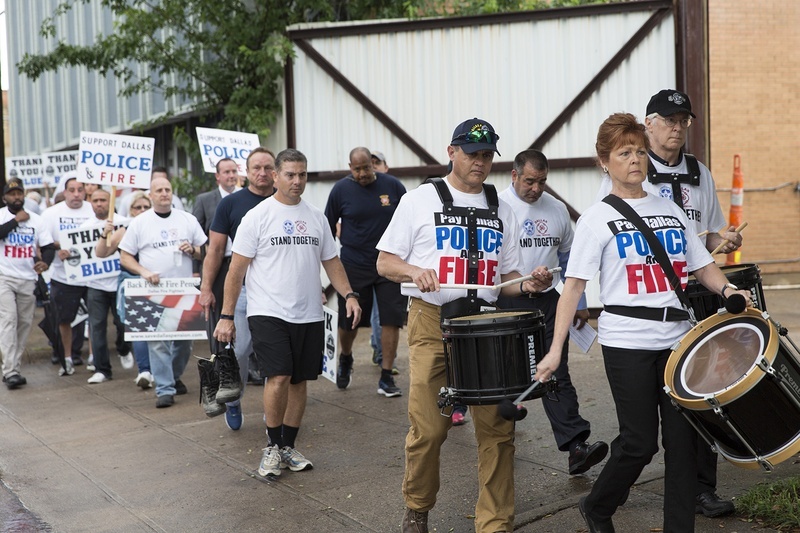 Dallas police officers and firefighters march in protest of their failing pension fund in Dallas on April 26, 2017. The bruising battles over legislative fixes to failing pension systems in Dallas and Houston could eventually evolve into a statewide war over the kind of retirement funds public employees should be offered. For decades, cities have used the promise of lucrative and dependable pensions as a way to help recruit for public safety jobs. They also use differences in pension benefits as a way to pull more experienced officers from other cities’ departments. Michael Mata was already a cop when he heard that Dallas’ pension benefits could help him retire a millionaire. “I was specifically told that when I was hired from San Antonio,” the Dallas police sergeant told the Texas Tribune last week. During legislative testimony and interviews in recent months, first responders have repeatedly said that cities have long managed to avoid paying them higher salaries for dangerous jobs by promising solid, attractive pension plans. Yet now that the Dallas and Houston pension problems have become financial crises threatening catastrophic fallout in two of America’s biggest cities – a situation that has driven some first responders to retire or change departments – some business leaders and conservatives are pushing for a sea change in public employee retirements. State Sen. Paul Bettencourt, R-Houston, authored Senate Bill 1752, which would allow voters in Texas cities to decide whether to switch new public employees to defined contribution plans. Such plans are akin to 401(k)s because their funds fluctuate with the market. They do not guarantee minimum monthly payments for employees to receive upon retirement, which is what defined benefit plans like pensions do. While potentially less lucrative or guaranteed for police and firefighters, defined contribution plans can also be less costly and risky for cities, which contribute tax dollars into employee retirement funds. Bettencourt and others say pension crises across the U.S. show that guaranteed retirement payments offered in defined benefit plans are no longer affordable. “You can see the trajectory of growth is unsustainable,” James Quintero, a pension expert at the Texas Public Policy Foundation, a conservative think tank, said while testifying for Bettencourt’s bill last week. But officials, police officers and firefighters in both Houston and Dallas say defined contribution plans will only exacerbate current problems. Last week, they warned that their cities would be left with crippling first responder shortages if legislative fixes that keep their defined benefit plans going don’t reach the governor’s desk before the session ends on May 29. Such shortages would lead to lower response times and spikes in crime rates, they warn. “If we don’t get pension reform, I want to apologize now,” Houston Police Chief Art Acevedo said at a press conference. How this emerging debate plays out could undermine Houston Mayor Sylvester Turner’s plan to shore up billions in that city’s pension shortfalls. More broadly, it could dramatically change the ways in which police and fire departments in Texas lure and keep enough first responders to sufficiently serve their cities. “They know if they get Dallas and Houston to fall, the other cities are next,” Mata said. Officials in Dallas and Houston – even those who say existing pension systems have become too costly for taxpayers – agree with their first responders that shifting to defined contribution plans is a bad idea. Supporters of such a change, like Bill King, a Houston businessman who ran against Turner in the 2015 Houston mayoral race, admit they face a tough fight getting politicians to back changes that first responders so adamantly oppose. “You have employee groups who have a big impact on local elections, so the decision makers are worried about what those employee groups are going to say about this,” King said. Bettencourt’s bill about pension elections has yet to leave the Senate state affairs committee. During a recent hearing on the bill, he was unable to point to any support for it among municipal employee or first responder groups when state Sen. Craig Estes, R-Wichita Falls, asked for some. Still, Bettencourt is trying another tactic. Houston city officials are currently verifying that a petition calling for an election on switching new Houston employees to defined contribution plans has enough signatures to force the matter to a vote. That could change the city charter, but Houston’s pension funds are governed by state law. So Bettencourt plans to attach an amendment to Senate Bill 2190, a Houston pension overhaul bill that would bind the retirement funds to the outcome of such an election. “This is just real simple: Let the people vote,” Bettencourt said in an interview. There’s so far no provision about defined contribution plans in a bill moving through the House, which seeks to overhaul Dallas’ pension fund. House Bill 3158 has the support of many North Texas lawmakers and the city’s police and firefighter pension board. But Dallas Mayor Mike Rawlings and other City Council members oppose it because of the amount of money it requires the city to contribute and how the retirement system board would be structured. The battle over HB 3158 has exposed a vitriolic divide between Rawlings and his city’s police officers and firefighters. First responders have cited his opposition to the bill in accusing him of trying to subvert the reform effort so the retirement system will fail and be replaced with something new and less costly, a charge Rawlings denies. Some of the opposition to Bettencourt’s legislative maneuvering derives from a lack of knowledge about how, exactly, a switch to defined contribution plans would impact existing pension funds. But the upper chamber has already passed Senate Bill 936, which calls for a committee to study public pensions in Texas. One of the committee’s tasks would be to assess the feasibility of defined contribution plans. The latter is a kind of retirement plan that is similar to a pension, but instead of money being pooled into one large fund, each employee has their own separate account. Houston leaders say no such plan was offered to police, firefighters or municipal employees when they negotiated a pension reform plan with city officials and they don’t know enough about the idea to support it so late in the legislative session. Bettencourt’s efforts to promote such a drastic overhaul of Houston’s pension system have drawn the ire of Houston officials who accuse the senator of trying to complicate or torpedo their pension reform attempts. They say that the police and municipal employee pensions never would have agreed to benefit cuts, a key tenant of the reform bill, if any deal included a provision on switching to defined contribution plans. “Since he’s not getting that one part, he’s willing to gum up this entire process,” Ray Hunt, president of the Houston Police Officers’ Union, said at a press conference last week. Bettencourt said he didn’t expect such pushback on putting the matter to voters whose taxes pay the pension costs. “I’m shocked, saddened and surprised there would be such a reaction,” he said. Hundreds of Dallas police officers stood at City Hall last week to oppose Mayor Mike Rawlings calls for residents to oppose a legislative fix to the rapidly failing first responder pension fund. As the Texas Legislature considers bills aimed at fixing the Houston and Dallas pension problems. several of its members have personal or business ties to those cities’ pension systems. Disclosure: The Texas Public Policy Foundation and the Laura and John Arnold Foundation have been financial supporter of The Texas Tribune. A complete list of Tribune donors and sponsors can be viewed here. This article originally appeared in The Texas Tribune at https://www.texastribune.org/2017/05/01/pension-fights-could-alter-how-texas-cities-hire-keep-first-responders/.